These White Chocolate Candy Cane Drop cookies are the perfect cookies for Christmas or for your cookie exchange! Baked with white chocolate chips and candy cane bits, they are beautiful and festive! Christmas would not be Christmas without these cookies. They are, quite simply, the most delicious, refreshing cookies you will ever eat. Yes, refreshing. Like skiing down the Alps, the powder flying in your face, sheer joy oozing from every pore. Exhilarating. Transcendent. Life-changing. O.K. I may be overselling these a bit, but not much. Try them. You’ll see. You know how you always have way more candy canes than you know what to do with? There are only so many cups of hot cocoa you can stir with a candy cane, right? (Some of you may dispute that there is a limit on the number of cups of hot cocoa one may consume in the winter. That is your right as an American. Even if you are not an American, you can still have an opinion regarding the proper consumption of hot chocolate). My kids personally will not just eat a straight-up candy cane. Neither will I, to tell the truth. But we all LOVE, and I mean L.O.V.E. these cookies. Which Types of Pans are the Best for Baking Cookies? Cooking times will vary based on whether you’re using metal pans, stoneware, or Silpat. Watch the cookies carefully! As soon as they barely start to brown around the edges, take them out! You might think they aren’t done, but these overbake very quickly. They have a tendency to be crunchy rather than soft, but either way, they are amazing! for much cheaper. I like to use pizza stones rather than baking pans with sides, because the pizza stones are so much easier to clean. The cookies will look different depending on which type of pan you use (metal, stoneware, or metal covered with silicone baking sheets). I almost never use metal pans any more, but I do try one batch on both the stoneware and baking mats to see which produce the most beautiful cookies. 1.When you make these cookies, you will notice that the dough is very stiff. My hand mixer couldn’t handle it after the first two cups of flour, so I stirred in the rest by hand. You also have to stir in the crushed candy canes and chocolate chips by hand. 2. After I put the dough on the cookie sheets, I smash them just a little bit to help them spread while baking. 3. Warning! Don’t eat these straight out of the oven, because the melted candy cane can be really hot! I know it’s hard, but try to wait at least 20 minutes or more! We give these to friends and neighbors every year for Christmas, and everyone RAVES over them. But if you don’t have time before Christmas, no worries. Just use up all those leftover candy canes AFTER Christmas and you will be golden. 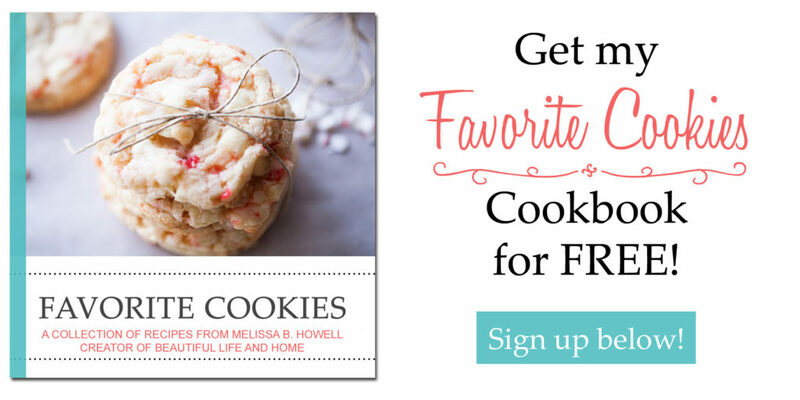 Looking for more great Christmas cookies perfect for a cookie exchange? Try these super popular Chocolate Orange Cookies, Peppermint Chocolate Slice and Bake Cookies, and Cranberry Orange White Chocolate Chip Cookies. Festive cookies perfect for Christmas and cookie exchanges! Full of white chocolate chips and candy cane bits, these cookies are refreshing and fun! In large mixing bowl, beat butter with an electric mixer on medium to high speed for 30 seconds. Add sugars, baking powder, and salt. Beat until combined, scraping bowl occasionally. Beat in as much flour as you can with the mixer. If it gets too tough, mix in the rest by hand. The dough should be very stiff. Stir in the chopped candy canes and white chocolate chips. Using a large cookie scoop, place the dough two inches apart onto a cookie sheet lined with parchment paper or a silicone mat. Bake 10-13 minutes, or until lightly browned around the edges. Do not overbake! Let cool for about 10 minutes on pan before transferring to wire rack to cool. Have you subscribed yet? You’ll get my recipe ebook “The Top Ten” which also contains the bonus super-secret recipe for Lemon Meringue Pie Ice Cream. It will never appear on this blog, so subscribing is the only way to get it! Just click here to sign up! Yes! Buy candy canes in bulk, because you’ll be making more than one batch of these! Thanks for stopping by! I actually just finished making a batch of these. (If I remember correctly I think we have Melain to thank for this recipe as it was part of a cookie exchange she participated in a few years ago. – a wonderful benefit.) The original recipe also suggests pressing some of the crushed candy onto the cookies just as they are out of the oven. Makes them look a bit more festive. And fortunately this year I found a bag of crushed candy canes in the baking isle so I didn’t have to smash candy canes this year. Wonderful cookies! These look delicious and festive! Approximately how many cookies do you typically get from this recipe? I would probably use heaping kitchen spoons to scoop, thanks! HI Laura! I think I typically get about 30 cookies using a medium cookie scoop. Good luck making them! I hope you like them! Thank you, Melissa! I will be baking on Friday & Saturday and will report back!! YUM!! Merry Christmas! These look festive and delicious! Any idea how many drop cookies we can get from one batch? Thanks! It makes about 40, depending on the size of your cookie scoop. Good luck! My family will love these! Thanks for sharing! I’m making these yummy looking cookies for a cookie exchange. Do you think it would be alright to make the dough a day ahead or would you recommend baking right away? You can make the dough ahead of time and refrigerate it. But when you are ready to bake, you’ll probably need to let the dough set up for at least a half an hour to soften up a bit. The dough gets super stiff and hard when chilled, and you might break your cookie scoop! Another thing you could do is scoop the dough ahead of time and just refrigerate the balls of dough on the cookie sheets. Mine did not turn out as nice looking, much more of a chocolate chip cookie colour, but still tasted delicious!! The great thing about these cookies is that they taste amazing, no matter how they look! Thanks for making them!